Many citizen actions have been organized in the past weeks in Budapest in protest against the modification of the law that would punish “recurrent residing in public places” with an increased fine of €530 or imprisonment. The law is supposed to come into force by December 1, 2011. 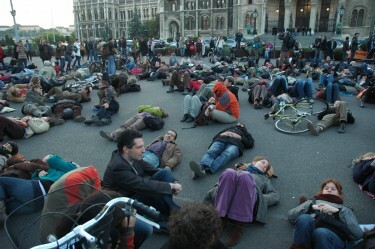 Sit-in in front of Hungarian Parliament for the protection of homeless peoples rights. Image by Janos Kis, copyright Demotix (17/10/11). About 30 protesters were arrested by the police and interrogated until late night. Kettős Mérce live-blogged [hu] the events at the office and shared a photo gallery of the sit-in. Index.hu news site's video of the sit-in and the arrests with English subtitles is here. A week later, a silent protest was organized [hu] in front of the Parliament. A photo gallery of Kettős Mérce is here. A ‘counter-post’ [hu] was published on Mandiner, also with a photo gallery of the same event. Börtön helyett lakhatást group called for solidarity with the homeless by staying on the streets of Budapest on the night when the regulation is coming into effect (Night of Solidarity Facebook event [hu]). […] From December 1, 2011, thousands of innocent people may be sent to prison. This is not about disputable stances, abstract political questions, smaller or bigger shady dealings, ridiculous paintings [referring to the new Hungarian constitution which has been illustrated with paintings ordered by the special commissioner of the Prime Minister], and it's not even about social justice. It can't be repeated enough times: this is about the fact that innocent citizens may be sent to prison. Today the Hungarian Civil Liberties Union (HCLU) started a campaign [hu] against the modification of the law, calling on citizens to write protest letters to the Minister of the Interior and to Máté Kocsis, the referee of the homeless issues. The campaign goes with the following video that compares the price of two nights spent at luxurious Budapest hotels to the price of spending two nights on a public bench. It should not be evident, but, of course, the latter one is more expensive.